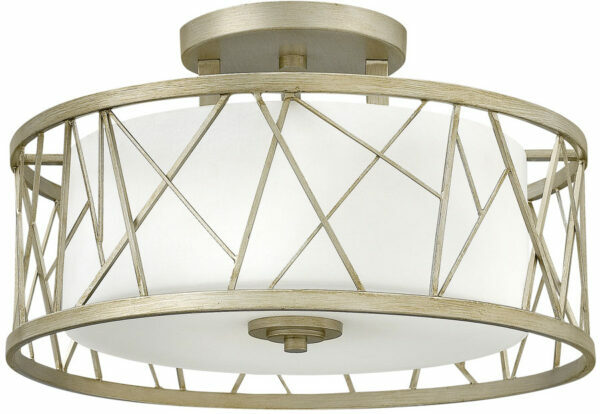 The Hinkley Nest 3 light semi flush ceiling light in silver leaf finish with etched glass shade finds its inspiration from patterns found in nature. This contemporary chandelier collection conveys an organic modern elegance in a silver leaf finish complemented by distressed etched glass. With a circular silver leaf finish ceiling rose and short drop rods supporting an outer geometric patterned drum shade, inset with a distressed etched glass inner shade for a softer light. At just 29cm high, this lovely contemporary ceiling light is suitable for any room in the house, even if you have low ceilings. Finding inspiration for a modern interior can be a daunting task. The Nest lighting collection brings together modern materials and contemporary styling in one sensational package. Designed in the USA by Hinkley Lighting, founded in 1922 in Cleveland, Ohio. Their long heritage combines with a pursuit of innovative design to create modern and contemporary lighting like the Nest 3 light semi flush ceiling light in silver leaf finish with etched glass shade you see here.